Canada’s Carbon Tax Failure, Eh? 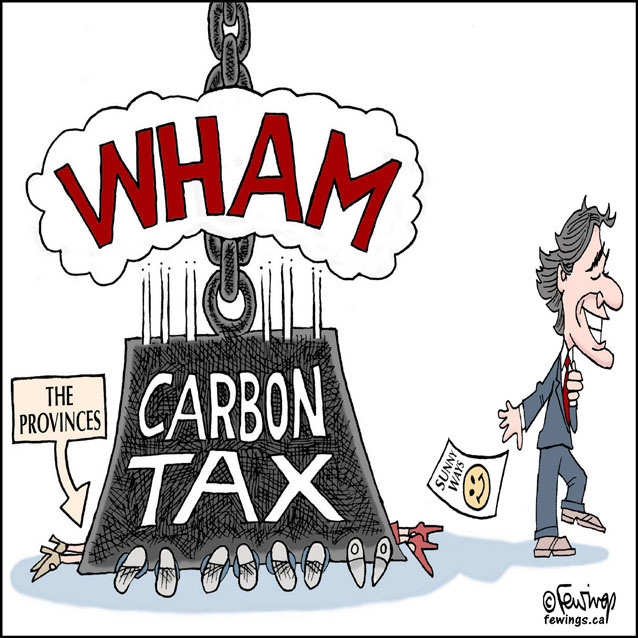 Just three years ago, carbon taxes seemed to be picking up steam in Canada with the progressively minded Prime Minster Justin Trudeau’s nomination in 2015. But just a few months ago, Ontario Premier Doug Ford was elected on a platform that prominently featured a repeal of Ontario’s carbon pricing scheme. If Ford fulfills this campaign promise and Trudeau continues to lose political clout, Canada will have only 3 provinces with some form carbon pricing, and 7 provinces that do not. Back in 2016, Trudeau announced that Canadian provinces would have until 2018 to tax CO2 generated by businesses, at a rate that would increase dramatically over the next 5 years. This despite the fact that in that countries with the most draconian carbon tax provincial policies like the one in British Columbia are having little effect on CO2. Worse still, the economic forecast for a Canadian carbon tax at the household level is resoundingly negative. In some provinces like Nova Scotia, the average household would have to pony up an additional $750 (US $) by 2022 in order to meet Trudeau’s demands. While it is hard to determine what the average household would pay in Vermont under the ESSEX Carbon Tax, the highest taxed Vermont household in our household fossil fuel sample would pay a little over $800 by 2026. Foreign businesses are beginning to invest in other countries to avoid Canada’s carbon taxes. According to the Wall Street Journal, foreign direct investment in Canada fell 56%(!) from 2013 to 2017, which has caused Canada’s prospects for economic growth to decrease. As a result, Trudeau has been forced to decrease his demands out of fear that his party would lose in the 2019 election. Bad ideas eventually lose to good ones. It is only a question of how much damage these ideas do before they die. While Canada’s carbon tax advocates held the majorities necessary to push through a carbon tax, the implementation of such bad policies has a way of turning advocates into antagonists. As Thomas Jefferson once said, “though the will of the majority is in all cases to prevail, that will, to be rightful, must be reasonable.” Canada’s carbon tax is not “reasonable.” Even now, new Canadian majorities are forming to remove this policy blight from Canadian shores. The silly carbon tax is just another way for left wing politicians to gain more power and control over everyone. The scariest aspect of the global warming hoax is how it has been seized on as a religion by so many non thinkers. These simpletons think it’s perfectly fine to blackball and silence authentic climatologists who have the courage to provide factual info and data, and to dissent from the phony scientists. Vermonters especially seem eager to commit economic suicide by continually electing ninnies who delude themselves that the way to prosperity and happiness is higher taxes. Although I am concerned about pollution and the trash being generated (mountains of cheap junk – and expensive stuff too – that ends up in landfills), and I live very simply, I am convinced that all the hype over “global warming,” (now called “climate change” so that whichever way the climate “changes,” they can say, “See, we were right.”) is about power and profits. Just this week, someone told me about a couple who have just bought another house (their fifth or sixth?) in New Orleans. I commented that that would not be my choice of a place to live and she agreed, but it soon became clear our reasons were very different. I don’t like heat and humidity. She said they must be “climate deniers” – that place is going to flood again. I didn’t say anything to her about my perspective, but after she left I realized I now have a new label. I am officially a “climate denier,” a term I had not heard before. It sure is interesting how easily people can be convinced to join a cause without asking some basic questions. Like – who gets the money? What will they do with it? Who gains financially? Who gains power? What are the political and financial ramifications of such causes? And, as mentioned in the previous comment, this is a religion. That is what I concluded after my conversation this week – that this woman’s dedication to her cause was on the level of religion. “Climate deniers.” In other words, if you don’t agree with our assessment, you are denying reality. Previous post: Look for the GMO Label!